The girls took off for the beach yesterday, and before they left they both mentioned they were craving salad and wanted a Vegan Ranch Dressing. And that my friends, is how a new recipe gets created …. I mean how on earth can I say no to that? Right? 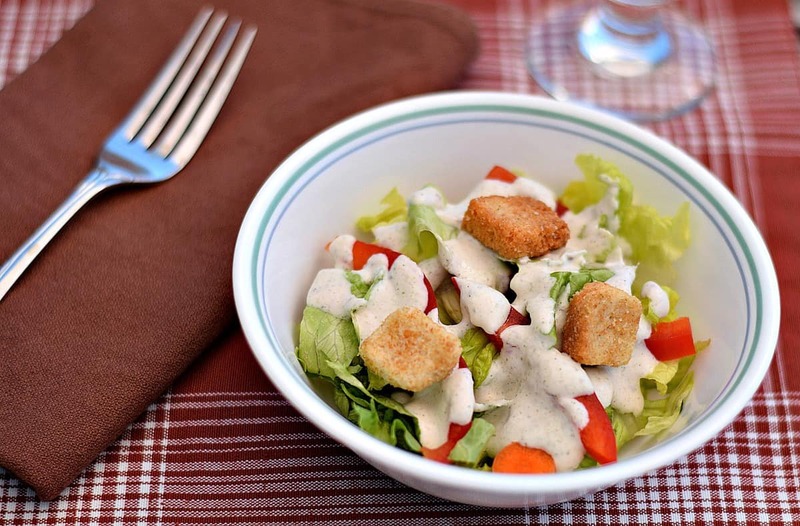 Knowing my daughter is Lactose Intolerant – and that Ranch is her favorite dressing – I immediately set off to create the perfect, Dairy-Free Vegan Ranch Dressing. I knew right away though that the million dollar question was going to be – Soy Based? Or Cashew Based? I know a lot of you hate Soy, and I know a lot of you avoid nuts. So there’s really no winning here – other than just making it the way I would like. So for that super creamy texture I remember about Ranch – I went with Cashews. If you want to try this recipe with a block of Tofu? Feel free and let me know how it turns out. 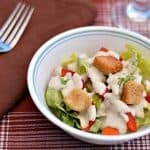 This Vegan Ranch Dressing is a simple recipe, with virtually no prep time other than soaking some Cashews for a while. The rest is all done in a blender – so clean-up is a breeze. What I did was basically start with just Cashews and Almond Milk in a blender – and then add some spices and flavorings bit by bit until I got the flavor I wanted. Funny thing was – something always seemed to be missing – until I found my secret ingredient. And now? It’s Creamy Vegan Ranch Perfection. Easy recipe – I promise. Soak a cup of whole, unroasted, unsalted, Cashews in some hot water for at least an hour. The longer the better. Afterwards, drain the cashews well and add to a blender. Add in the remaining spices and flavorings, and blend on high until smooth and creamy. You may want to stop and scrape down the sides occasionally. Pour into a container you can seal, and then refrigerate for at least an hour to thicken. The longer it sets, the thicker it will become. I had some the next day and it was perfect. Oh – and in case you’re wondering about that Secret Ingredient? Miso. 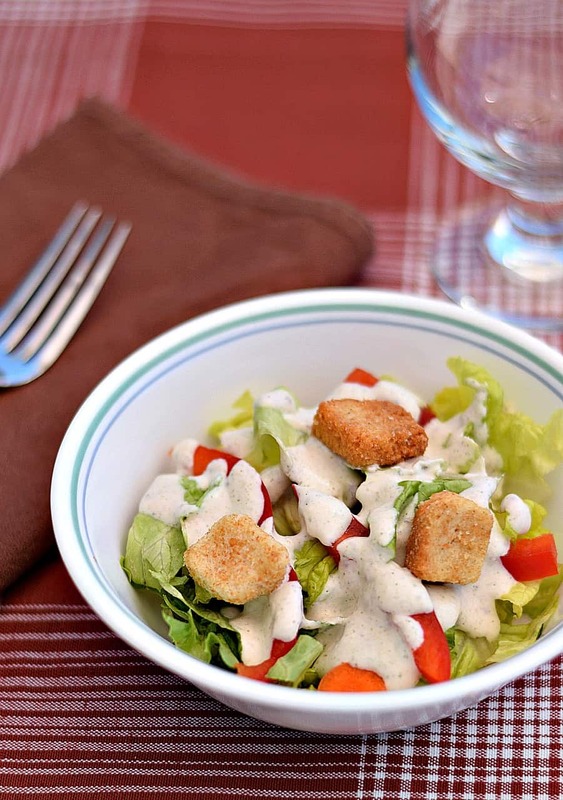 That added just the right pizzazz to make this the perfect Vegan Ranch Dressing. The Ultimate Vegan Ranch Dressing - completely oil-free and only using a few ingredients and spices. Perfect on a salad or just for veggie dipping. Soak Cashews in hot water for at least 1 hour. Drain well and add to blender along with remaining ingredients. This was delicious and passed the test with my non-vegan oil-eating, ranch loving family. Where do you buy miso? Is it a powder or a paste? Does it have to be refrigerated or is it shelf stable? I have no clue here 🙂 Thanks! Miso comes in a tub, much like Cream Cheese or Sour Cream. It will be refrigerated as it has live cultures – much like yogurt. It is a paste. You can find it in most health food stores, Whole Foods, New Seasons, etc. Some traditional grocery stores carry it too – like my Fred Meyer (Kroger). Asian markets and some grocery stores. It would be in the refrigerated section by the tofu. In some Asian markets its on a shelf but needs to be refrigerated after opening. Would dried dill weed work? I used 1 tsp dried dill weed and I liked the result. I like it! It’s very good on cucumbers. I used 1 tsp dried dill weed since I didn’t have ground seed. I didn’t remember to soak the cashews for an entire hour… I soaked in very hot water (but not boiling) them while I was getting the rest of the ingredients and my storage jar ready. I used my VitaMix blender. It’s got a good texture and a tang. We made this for dinner tonight for our taco salads. It was delicious! Thank you for your recipes. We are new to WFPB eating and are always looking for good recipes. OH. My. Goodness! I’ve been wheat and dairy free for many years now due to allergies and have just gone vegan within the last year, but I have never found a really good ranch dressing recipe – until now! This is so good I couldn’t quit licking the drips and the spatula after transferring from blender to bottle, and could almost drink it. Wow! Just what I’ve been looking for! How long will this last in the refrigerator? Not too long. It’ll probably get watery after a few days but you can mix it back up. The general rule in my house it to toss anything after 3-5 days. It’s looks like it would be easy to half the recipe if you think if wouldn’t get eaten before it needed to be trashed. I might try adding some nutritional yeast for a creamy cheese ranch. But not sure if it would taste bitter. I cannot get your Pinterest button to work on this recipe. My second attempt to make a non-dairy ranch dressing for my 5 yr old granddaughter who loves ranch dressing met with mixed reviews. Meaning I was the only one who really liked it. I only had Dill Weed, so will try another time with Dill Seed after adding it to my shopping list. Do you think subbing white beans on a 1:1 ratio for the nuts would work? Thanks! Beans will work in some things, and not in others. I tried using white beans in my coleslaw – just would not work. So try it….and see. Yikes, I don’t have cashews and am in the middle of cooking. I have made this twice. I think it is the best vegan ranch I have found. The first time I used only cashews. The second time I used 1/2 cashew and 1/2 white beans. Trying for a lower fat version.The texture was not as good with 1/2 white beans. The skins of the beans are kind of obvious. I might have been able to make it smoother if I blended it longer. Can’t wait to try your chili recipe and your coleslaw. Do you have fat/calorie or nutritional info for this recipe? Thanks! !